Walkin bathtubs could be just the thing residents of Roswell, GA, needs in their homes if they are dealing with limited mobility or daily physical discomfort. We understand that bathing safely is not a luxury, it’s a necessity. We also know that individuals value their privacy and want to bathe alone or with as little help as possible. We believe that the pain or mobility issues associated with aging or chronic health conditions shouldn’t mean that bathing in private is a thing of the past. Our walk in tub products offer unparalleled safety features like grab bars, side grips, slip-resistant surfaces, and locking doors, so users can enjoy bathing worry free. Walk in tubs are twice the depth of standard bathtubs, which means that most of the torso can be covered by soothing water without having to place oneself in an uncomfortable or possibly dangerous position. Bathers can just sit on the comfortable, chair-height seat and let the water work its magic. Furthermore, all of our walk in tubs feature a nonporous surface that is a snap to wipe clean. It won’t fade, chip, or peel, and will look beautiful for years to come. Even better, our sleek, modern tubs are available in a variety of gorgeous color options, so it’s easy to find a beautiful tub that will complement the existing décor in any bathroom. 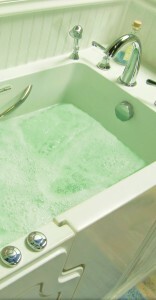 For more information about installation of walkin bathtubs, Roswell, Georgia, homeowners can contact us today. We’ll be happy to answer your questions and help you choose the perfect tub for your needs.